BERLIN — If you’re anything like me, you have fond childhood memories of sleeping in tents, building pillow forts, and playing in tree houses. There’s something sweetly nostalgic about being in a tiny cozy place. 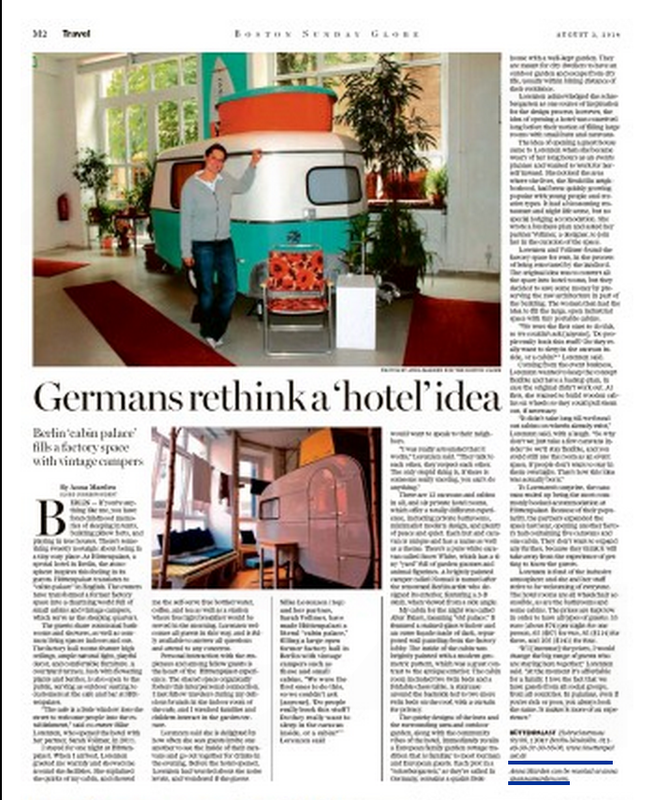 At Hüttenpalast, a special hotel in Berlin, the atmosphere inspires this feeling in its guests. Hüttenpalast translates to “cabin palace” in English. The owners have transformed a former factory space into a charming world full of small cabins and vintage campers, which serve as the sleeping quarters. The guests share communal bathrooms and showers, as well as common living spaces indoors and out. The factory hall rooms feature high ceilings, ample natural light, playful decor, and comfortable furniture. A courtyard terrace, lush with flowering plants and berries, is also open to the public, serving as outdoor seating to customers at the cafe and bar at Hüttenpalast. “The cafe is a little window into the street to welcome people into the establishment,” said co-owner Silke Lorenzen, who opened the hotel with her partner, Sarah Vollmer, in 2011. I stayed for one night at Hüttenpalast. When I arrived, Lorenzen greeted me warmly and showed me around the facilities. She explained the quirks of my cabin, and showed me the self-serve free bottled water, coffee, and tea as well as a station where free light breakfast would be served in the morning. Lorenzen welcomes all guests in this way, and is fully available to answer all questions and attend to any concerns. Personal interaction with the employees and among fellow guests is the heart of the Hüttenpalast experience. The shared space organically fosters this interpersonal connection. I met fellow travelers during my delicious brunch in the indoor room of the cafe, and I watched families and children interact in the garden terrace. Lorenzen said she is delighted by how often she sees guests invite one another to see the inside of their caravans and go out together for drinks in the evening. Before the hotel opened, Lorenzen had worried about the noise levels, and wondered if the guests would want to speak to their neighbors. There are 12 caravans and cabins in all, and six private hotel rooms, which offer a totally different experience, including private bathrooms, minimalist modern design, and plenty of peace and quiet. Each hut and caravan is unique and has a name as well as a theme. There’s a pure white caravan called Snow White, which has a tiny “yard” full of garden gnomes and animal figurines. A brightly painted camper called Nomad is named after the renowned Berlin artist who designed its exterior, featuring a 3-D skull, when viewed from a side angle. My cabin for the night was called Alter Palast, meaning “old palace.” It featured a stained-glass window and an outer façade made of dark, repurposed wall paneling from the factory lobby. The inside of the cabin was brightly painted with a modern geometric pattern, which was a great contrast to the antique exterior. The cabin room included two twin beds and a foldable chess table. A staircase around the backside led to two more twin beds on the roof, with a curtain for privacy. The quirky designs of the huts and the surrounding area and outdoor garden, along with the community vibes of the hotel, immediately recalls a European family garden cottage tradition that is familiar to most German and European guests. Each plot in a “schrebergarten,” as they’re called in Germany, contains a quaint little house with a well-kept garden. They are meant for city dwellers to have an outdoor garden and escape from city life, usually within biking distance of their residence. Lorenzen acknowledged the schrebergarten as one source of inspiration for the design process; however, the idea of opening a hotel was conceived long before their notion of filling large rooms with small huts and caravans. The idea of opening a guest house came to Lorenzen when she became weary of her long hours as an events planner and wanted to work for herself instead. She noticed the area where she lives, the Neukölln neighborhood, had been quickly growing popular with young people and creative types. It had a blossoming restaurant and night life scene, but no special lodging accomodation. She wrote a business plan and asked her partner Vollmer, a designer, to join her in the curation of the space. Lorenzen and Vollmer found the factory space for rent, in the process of being renovated by the landlord. The original idea was to convert all the space into hotel rooms, but they decided to save some money by preserving the raw architecture in part of the building. The women then had the idea to fill the large, open industrial space with tiny portable cabins. “We were the first ones to do this, so we couldn’t ask [anyone], ‘Do people really book this stuff? Do they really want to sleep in the caravan inside, or a cabin?’ ” Lorenzen said. Coming from the event business, Lorenzen wanted to keep the concept flexible and have a backup plan, in case the original didn’t work out. At first, she wanted to build wooden cabins on wheels so they could pull them out, if necessary. To Lorenzen’s surprise, the caravans ended up being the most commonly booked accommodation at Hüttenpalast. Because of their popularity, the partners expanded the space last year, opening another factory hall containing five caravans and one cabin. They don’t want to expand any further, because they think it will take away from the experience of getting to know the guests. Lorenzen is fond of the inclusive atmosphere and she and her staff strive to be welcoming of everyone. The hotel rooms are all wheelchair accessible, as are the bathrooms and some cabins. The prices are kept low in order to have all types of guests: 55 euro (about $74) per night for one person, 65 ($87) for two, 85 ($114) for three, and 105 ($141) for four.